Canadian economy ends the third quarter on a weak note. 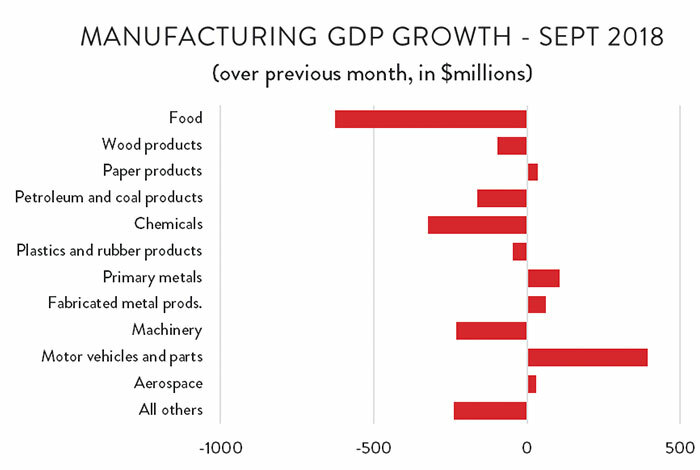 Economic growth dipped into negative territory in September, driven lower by a significant decline in energy sector and manufacturing activity. 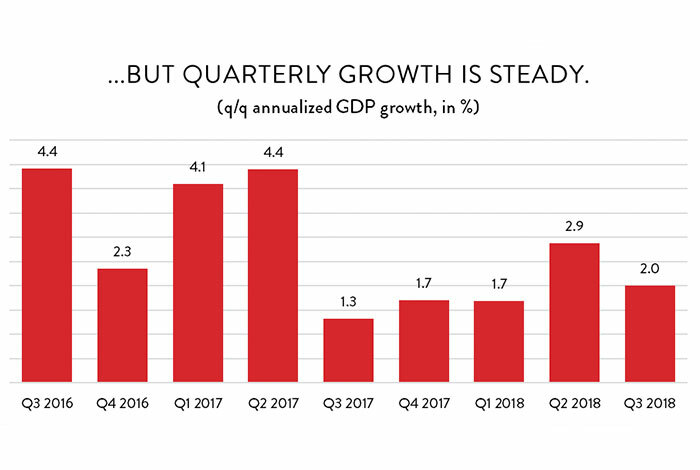 While there are some worrying signs emerging in the Canadian economy, residual strength from earlier in the year kept third quarter results in reasonably positive territory. Beginning with the monthly numbers, GDP fell by 0.07 per cent in September – equivalent to an annualized decline of about 0.9 per cent. That represents the first month-over-month drop in GDP since January and is part of an emerging trend of slower economic growth across the country; the Canadian economy has only posted one solid month of growth since May. However, even though growth was flat over the summer, momentum that built up earlier in the year meant that overall GDP levels were higher than they were in the spring. As a result, GDP growth in Q3 came in at an annualized rate of 2.0 per cent – about in line with general expectations for how the Canadian economy would do in 2018. The biggest concern coming out of the quarterly GDP numbers was a worrying drop in business investment. Since late 2016, non-residential investment in machinery, equipment and facilities had been slowly recovering from a dramatic decline in the wake of the oil price crash. However, that recovery ground to a halt in the second quarter of 2018, and then reversed itself over the summer. 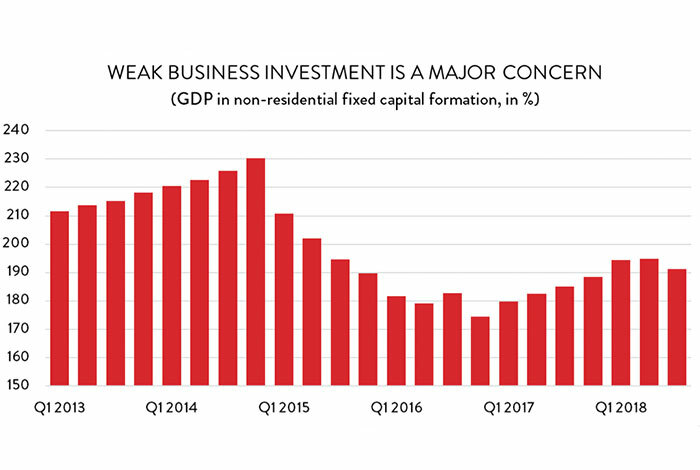 Non-residential investment fell by 7.1 per cent in Q3 (at annualized rates), dropping to its lowest level since the end of 2017. Non-residential business investment remains 17 per cent below its peak in the final quarter of 2014. In fact, beyond the headline numbers, there was little to cheer about in the third quarter generally. Household spending growth slowed to its lowest level in two-and-a-half years and exports were up only modestly. The biggest growth drivers last quarter were an uptick in government spending and a dramatic decline in imports. For economic accounting purposes, imports are a drain on GDP because they represent spending on goods and services not produced in Canada. That spending fell dramatically last quarter. 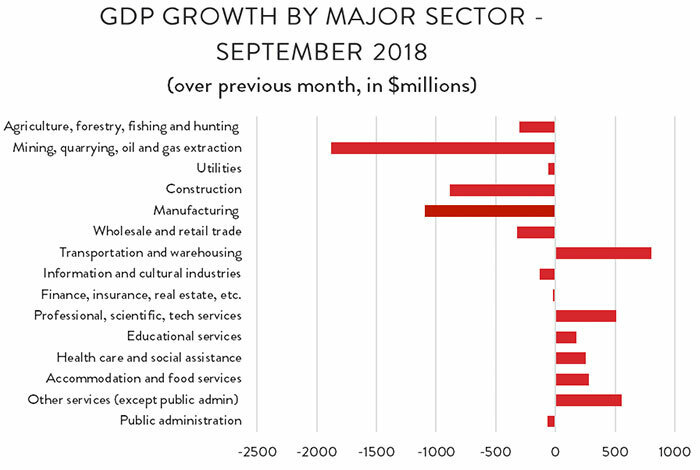 Turning back to the monthly GDP numbers, the decline in economic activity in September was the result of a substantial drop in industrial output across the country. Declining oil sands activity drove energy sector GDP down 15.3 per cent compared to August (on an annualized basis). Meanwhile, construction GDP was down by 7.2 per cent, and manufacturing value-added output dropped by 6.3 per cent. Widespread gains in the services sector managed to claw back a little more than half of the losses in industrial output. Leading the way was the transportation and warehousing sector, with additional notable gains in retail trade; professional, scientific and technical services; and real estate-related industries. Looking more closely at manufacturing, the sector is continuing to retreat from its two-month surge in June and July. 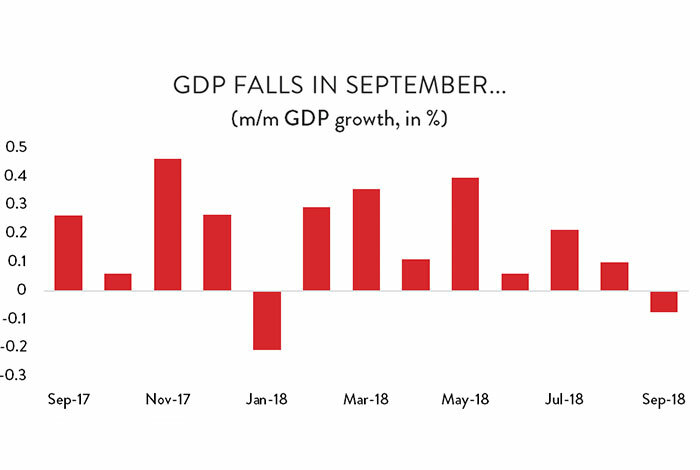 GDP fell by 0.5 per cent compared to August (as noted above, equivalent to 6.3 per cent on an annualized basis), adding to a 0.4 per cent decrease the previous month. The good news is that strong growth earlier in the year has given manufacturing decent momentum as 2018 chugs along. 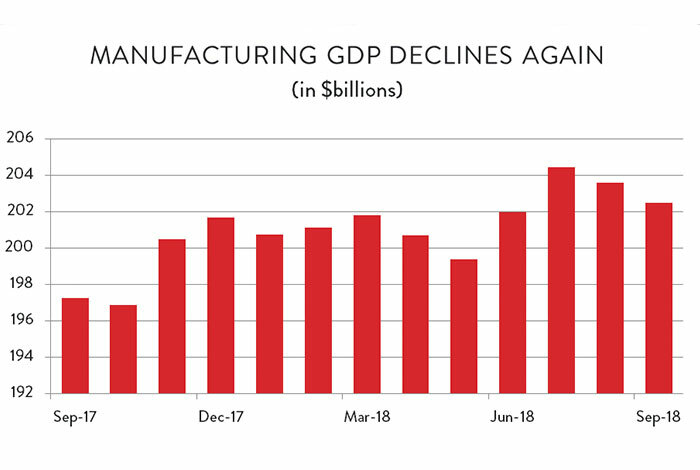 Through nine months, manufacturing GDP is tracking 2.6 per cent higher than it was over the same period last year – outpacing growth for the Canadian economy as a whole. In terms of specific industries, by far the largest decline in value-added production in September was in food processing, where GDP was down by 2.2 per cent. There were also notable drops in chemicals and machinery production, both of which fell for the second consecutive month. There were also substantial declines in many of Canada’s smaller manufacturing industries including clothing and textiles, computers and electronics products, and electrical equipment and appliances.